Our London Training Centre is the Largest of our UK Training centers. Both the Managing Safely and the Working Safely IOSH courses are held fortnightly.Training center is located outside London Congestion Charging zone, the tube station is a very short walk and there is also free parking for students. The London and South-east trainers are some of the best trainers in the country, being professionals and senior members of the Institution of Safety & Health (IOSH) as well as NEBOSH and the CITB. They are very experienced professionals whom have vast experience as tutors and trainers, delivering training to individuals, private companies as well as large public and corporate institutions including the London Underground, The Environment Agency not to mention various bluechip companies form the FTSE 100. 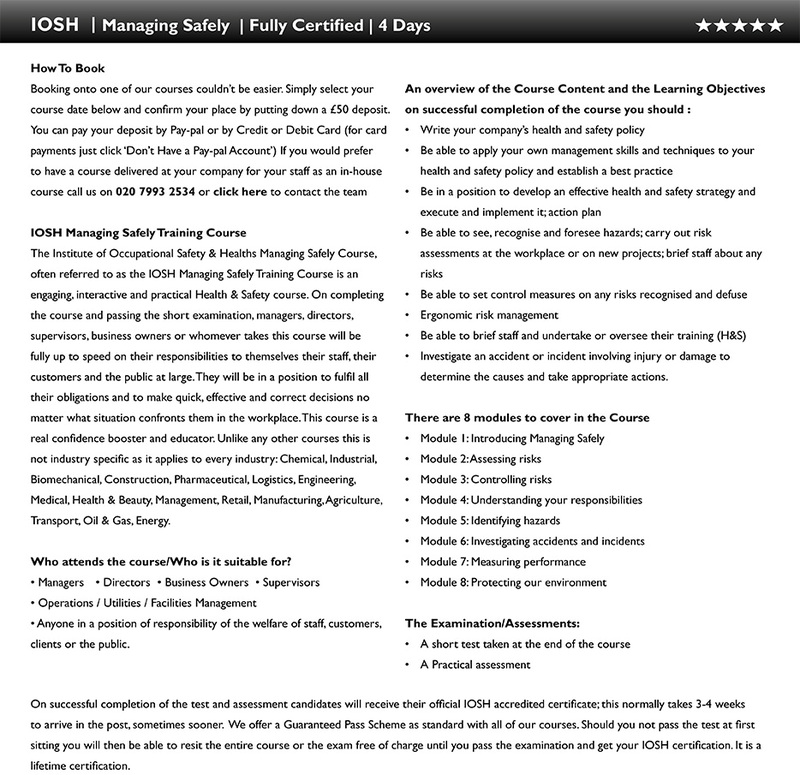 IOSH Managing Safely Training Course The Institute of Occupational Safety & Healths Managing Safely Course, often referred to as the IOSH Managing Safely Training Course is an engaging, interactive and practical Health & Safety course. On completing the course and passing the short examination at the end of the course, managers, directors, supervisors, business owners whomever takes this course will be fully up to speed on their responsibilities to themselves their staff, their customers and the public at large. They will be in a position to fulfil all their obligations and more. They shall be in a position to make quick, effective and correct decisions no matter what situation confronts them in the workplace. This course is a real confidence booster and educatorle=”.” href=”http://pipublic.com”>.Unlike other courses this course is not industry specific it applies to every industry: Chemical, Industrial, Bio mechanical, Construction, Pharmaceutical, Logistics, Engineering, Medical, Health & Beauty, Management, Retail, Manufacturing, Agriculture, Transport, Oil & Gas, Energy.. Who attends the course/Who is it suitable for? On successful completion of the test and assessment candidates will receive their official IOSH accredited certificate; this normally takes 3-4 weeks to arrive in the post, sometimes sooner. We offer a Guaranteed Pass Scheme as standard with all of our courses. Should you not pass the test at first sitting you will then be able to resit the entire course or the exam free of charge until you pass the examination and get your IOSH certification. This certification is a lifetime certification.